Registration for the 2019-2020 school year opens to the public on February 5th. Applications are available at the church office or by clicking on the link below. Call 332-8092 for more info. We are proud to offer a Christ centered Kindergarten/Preschool program here at Kelleytown. church preschool programs in Hartsville. Classes are offered for 2K - 5K and taught using the ABeka & also the WEE Learn curriculum by qualified and loving teachers. Registration is held in February of each year. 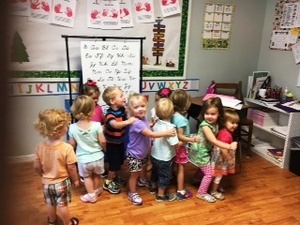 The 2K Class is having fun as they start the new school year!! Ms. 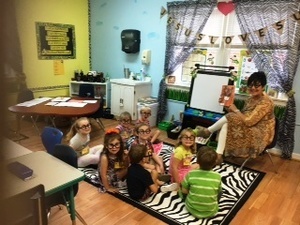 Brand's 4K class enjoys getting into character during story time! Our mission is to extend the ministry of Kelleytown Baptist by providing a safe, loving and Christ centered learning environment for two through five year olds. Guidance, ministry and outreach are offered to the children and their families. 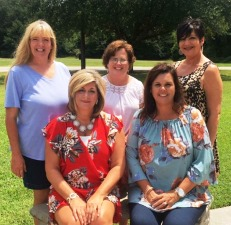 We are staffed by a caring group of Christian teachers that create a wonderful learning environment for your child. All teachers have experience in early childhood education and are screened. We believe that each child is a unique individual. We are sensitive to a child’s spiritual, social, emotional and physical needs. We provide a warm and nurturing atmosphere where a child can grow independence and build self-esteem and self-sufficiency. We provide a wide range of appropriate learning activities which offer a balance of structure for each age level. Each day allows for centers, circle time, art, playground time and snack. Our classes use the A BEKA as well as the WEE Learn curriculum. We offer a variety of classes Monday thru Friday from 8:20am to 12:00pm during the traditional school year which coincides with Darlington County Public Schools. Enrollment is ongoing and based on availability. In case of inclement weather, the Kindergarten will again coincide with Darlington County. Early Bird Care is available beginning at8:00 each day. To inquire about this service please contact the church office or your child's teacher.